There are many types of laser eye surgery, but the most common and well-known type of laser eye surgery is LASIK. LASIK is used to treat myopia (nearsightedness), hyperopia (farsightedness), and astigmatism (distorted vision). 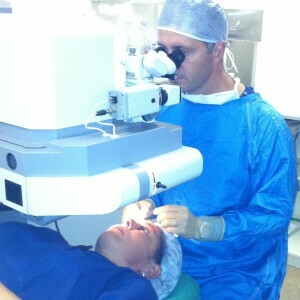 The procedure takes about 10 minutes per eye in total and is done under local anaesthetic. The procedure is absolutely painless. During the procedure, the corneal tissue is carefully flapped open with a special oscillating blade. The cornea is then lasered, and the protecting tissue gets flapped back into place. Corneal tissue has excellent natural bonding qualities that allow effective healing without the use of stitches. The purpose of laser eye surgery is to correct refractive errors and reduce a person’s dependency on glasses or contact lenses. The procedure uses a laser to reshape the cornea, the clear outer layer of the eye, in order to change the eye’s focusing power and improve vision.